JOIN US on Sunday March 19th at 11:00am as we celebrate our 68th Year in Educating our future Jewish Community Leaders! Please RSVP at www.LAHHS.org/openhouse EARN High School foreign language credits Get EDGE on college applications FLEX options including ONLINE & Sunday Only classes! 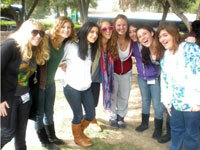 Convenient locations in CITY & VALLEY Weekend TRIPS & fun engaging classes Amazing ISRAEL Partnership program Build LIFELONG friendships 7th-12th Grades WASC-accredited Celebrating 68 YEARS 1ST Supplemental Hebrew High School in LA! Due to popular demand, we are holding another Open House! 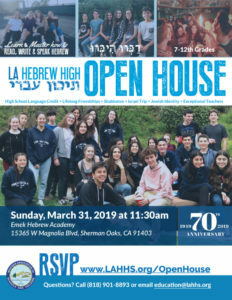 Please RSVP and share with friends who may be interested in learning about the benefits of an LA Hebrew High education.